BOTTOM LINE: A fun farcical romp by George Bernard Shaw about fidelity and marriage. “I may be doing wrong, but I am doing it in a respectful way,” announces Mr. Sibthorpe Juno (Matthew Goodrich), one of the two intertwined couples at the center of Shiyr Productions’ Overruled, a blithe one-act about marriage and morals. While on a pleasure cruise, Mr. Juno, it seems, has fallen helplessly in love with Mrs. Lunn (Kelsey Claire), the wife of another man. Conveniently, Mr. Lunn just so happens to have also taken up a love affair—with Mrs. Juno (Tamra Paselk). The two couples meet face to face, playfully debating the nature of married life and how they could find themselves in such an unusual predicament. The clever, farcical one-act play, written by George Bernard Shaw in 1912, comments on the pretensions of married people with dated, heightened language but modern cynicism. The show approaches the issue of fidelity and jealousy with a self-awareness that makes the soap opera drama of love affairs seem laughably outrageous, and it successfully mocks high society's sense of decorum gleefully. The piece is not an argument for or against polygamy, but instead is a commentary on the ways that society has taught us to behave. Directed by Elena Kritter for Shiyr Productions, the show flies by in forty-five minutes and moves with a bright, fun rapidity. Overruled’s cast features strong performances, particularly from the two wives, Mrs. Lunn (Claire) and Mrs. Juno (Paselk). Paselk flitters about the space nervously but with charming intelligence. Claire is delightfully droll, moving as if she were molasses being poured out of a bottle. Mr. Lunn (Douglas Rizzo Johnson) and Mr. Juno (Goodrich) are also both strong, though their performances lack the grounded confidence of the women. With simple staging and lovely period costumes, the show is engaging and effective. To call Overruled an “immersive party experience” (which is how the show is advertised) is a bit of a stretch, however. Though audience members are invited to attend in their finest twenties attire, the action of the play is squarely not interactive, as the audience is seated in sofas and chairs around a small back room of the bar Papillion. The show is bookended with drink specials at the bar, which encourages conversation amongst audience members, but does not offer any opportunity for audience interactions to have direct impact on the play itself. That being said, it is amusing to realize that director Kritter has staged intimate, private conversations squarely in the middle of prying eyes. Shaw has written laugh-out-loud lines, such as one moment where one husband tells the other that he is “the anticipation. You’re the disappointment.” The couples discuss the possibilities of putting together lists of names of prospective future spouses, useful for when their current partner is dead. Shiyr Production’s Overruled makes the most of these lines and offers laughs, booze, and a fun romp. The show makes such a convincing case for questioning monogamy that it might inspire you to find a new lover. 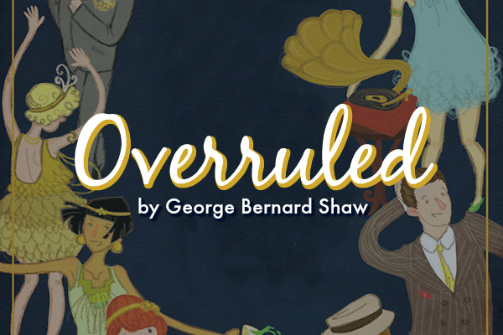 Overruled is written by George Bernard Shaw. Directed by Elena Kritter. Produced by Tamra Paselk. Dialect Coaching by Patricia Fletcher. Acting Coaching by Bruce McCarty. The cast was Kelsey Claire, Matthew Goodrich, Douglas Rizzo Johnson and Tamra Paselk.